Go Run Miami: In the Long Run What to do before, during, and after your biggest workout of the week. 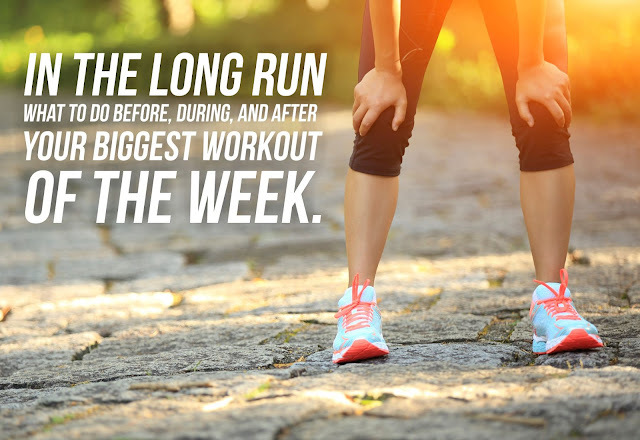 In the Long Run What to do before, during, and after your biggest workout of the week. If you think of your body as an engine, then a great way to add horsepower is with a good, long run a continuous effort ranging from 90 minutes to 3.5 hours in duration, depending on your experience and race goals. By going long, you increase aerobic capacity by building muscle enzymes, capillaries that deliver blood to muscles, and mitochondria (which help power cells). Spending more time on your feet also strengthens the musculoskeletal system. And as even nonphysiologists know, you build mental toughness by pushing your body through those times it would prefer to wave a white flag. Long runs have served as a staple in training programs for more than a half-century. And with so many benefits, coaches recommend them even for runners who don't have a race on the calendar. For those who do, these workouts prime your body to perform optimally on race morning, so start them around the same time that your event starts. Here's a minute-by-minute guide to successfully going long. Eat a meal that consists of .5 to 1 gram of carbohydrate for every pound of body weight, "In other words, if you're 150 pounds, aim to consume 75 to 150 grams of carbs"--300 to 600 calories. Stay light on protein, fiber, and fat, which take longer to digest and don't fuel muscles as efficiently. Consume 17 to 20 ounces of water or sports drink dehydration has been clinically shown to derail performance. This is checklist time. BodyGlide? Energy gels? Sunscreen? "But don't do too much, You have a big effort coming, so stay relaxed. Begin to refuel. Take in gels and fluids at least every three-quarters of an hour during your run. By fueling early, you are less likely to deplete your stores. And if you take in bits of fuel at a time and chase with water, you'll absorb it better and are less likely to have GI distress. Tough it out. As you get toward the end of the run, the fatigue curve ramps up. You have to increase your focus and intensity to maintain the same pace. But keeping your pace constant, or even picking it up a bit, is crucial to reaping maximal gains. Recommends using mantras for those soul-searching moments. You'll want to collapse on the couch. Don't. You should immediately start taking in fluids. Rehydration comes in many forms: water, sports recovery drinks, smoothies, even chocolate milk. Within 30 minutes,Recommends also suggests carbs for glycogen replacement and boosting the immune system, plus protein to aid in muscle repair. How those carbs and proteins come--whether in drinks, solid food, or a mix of both--is a matter of individual preference and depends on what your stomach is able to handle. Stay active. Find a routine that helps you avoid the onset of soreness and tightening that can follow a hard effort, whether that's a session of active stretching or a walk around the block with your dog.has found that subjects who used foam rollers on their leg muscles following workouts experienced less soreness and recovered faster than those who didn't. The rolling would help runners recover from a long-distance run.Recommends performing a full lower-body foam roll, including your calves, hamstrings, quadriceps, glutes, and IT bands.